OK! Raise your hand if you love counting books! Now raise your hand if you love alphabet books! Wait! You raised your hand both times. Don’t you have a favorite? OK! Let’s try again. Counting. Alphabet. You did it again. Well, if you can’t choose then you’re going to double-love . . . Themes: 123! No, ABC! No, 123! No, ABC! “Now, stop it you two! I am in charge of this blog!” said Penny. Synopsis: (from publisher’s website) Numbers and Letters both want to be the stars of this book! And when one alligator (that starts with an A!) and two bears (2 of them!) and three cars (1, 2, 3! A, B, C!) begin to show up, the havoc that ensues is as joyous a romp as a counting book . . . that is, an ABC book . . . has ever been. With vivid illustrations from author-illustrator Mike Boldt, this fresh and funny picture book plays with numbers and letters in the most imaginative way. Instead of posting the opening text of the book, I have the book trailer. It includes the opening text and will surely lure you to the library or the bookstore. Resources: ABCya.com is an excellent site for practice with numbers and letters. Just click on a grade level and you’ll find the game categories. With these ABC coloring pages and these number templates, kids could make their own 123 versus ABC book. And…this would be wonderful for a classroom book. Each student could be assigned a number and letter (just like in the book 1 would go with A, 2 would go with B, etc.) and design their page. Then all the pages could be bound together as a big book for the classroom. I found the blog of a first grade teacher who has a lot of posts about classroom books. HERE is the link. Why I Like This Book: I know you couldn’t see…but I raised BOTH hands to counting books and BOTH hands to alphabet books. I do love them both. Let’s face it, number and letter books have been done over and over again and there are a lot of choices out there. So in order to rank among my favorites, they have to be unique. 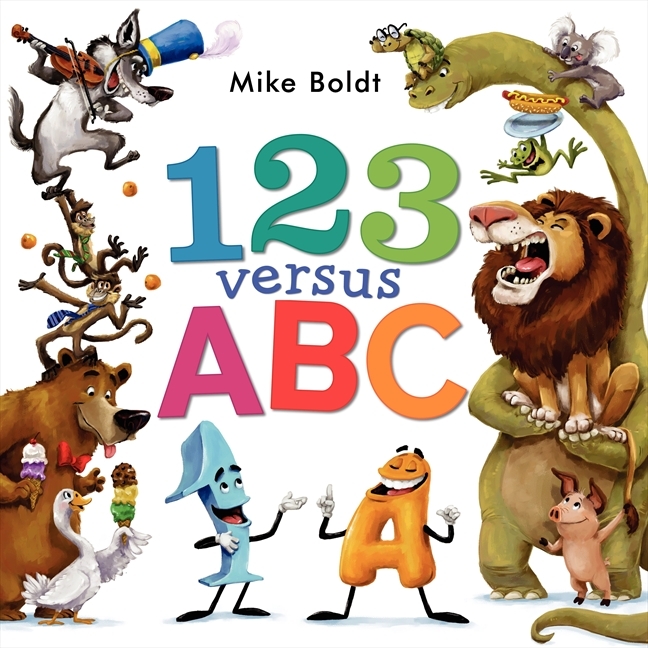 Mike Boldt nailed unique and made 123 AND ABC stars of this funny and entertaining book. His illustrations are colorful and lively. The expressions on the faces of the numbers and letters add such personality. I love the way he used blue to denote number-related text and orange to denote letter-related text. So clever! Bottom line…I double-love this book and I think you will, too!